In a previous post we mentioned seeking inspiration from other notable photographers. Today we attempt the impossible, by looking at the work of the legendary Annie Leibovitz. The artist is renown for her portraiture. Sometimes formal, often relaxed, but never accidental. An extreme example of her work at its most complex is that of the Disney Dream series of portraiture, that first appeared in 2007, featuring Beyoncé as Alice in Wonderland. Much of Annie’s commercial work involves complex lighting setups, huge visual effects activities and lots of post production (Photoshop etc). In reality, we have no ability to recreate that kind of image in a theme park, but we certainly can take some special cues from the Beyonce image to great effect! Here are some pointers from the Alice image that can help us create great vacation pictures! Annie Leibovitz always has a wardrobe and makeup team on set. Think about what the kids will be wearing on their most magical day at the Magic Kingdom! Make sure they’ve got something on that will help bring the best out of the day! Take a pocket hairbrush and some wet wipes to tidy hair and remove signs of lunch! Carefully planned lighting setups make the shot work so well for professional photographers. Learn how to use your camera flash during the day to stunning effect! This shot used a similar technique to the Beyonce/Alice shot, by using a slow shutter speed and the on camera flash to create a very dramatic effect. If you are able to get your subject and your camera moving together, you get a beautiful blurred background but a sharp shot of the subject, thanks to the ‘freeze’ effect of the flash. Leibovitz uses a classic foreground, subject and background technique in this shot, ensuring that all three include special interest. Nothing in this image of Beyonce is chance. As the main subject of the shot, Beyonce’s eyes stare at the camera, creating an effect that she is actually looking at you. The Mad Hatter in the foreground creates a sense of excitement as he looks away from the camera, suggesting that something is really going on in the scene. The March Hare does the same, but cleverly looks another direction, emphasising that this is a little ‘dangerous’. The blurred background makes the whole scene look very fast paced, adding further to the excitement! If we took any one of those elements of this beautiful picture away, the effect would collapse. Can you imagine if that grass wasn’t blurred? Or that the men were looking at you too? Or if Beyonce was looking at her shoes? OK, so we aren’t expecting you to pull off a picture like that, but you could step closer towards it each time you get that camera out! Try just one new idea that Leibovitz used. As one of the world’s greatest photographers, she is after all worth mimicking! Good luck and happy snapping!! 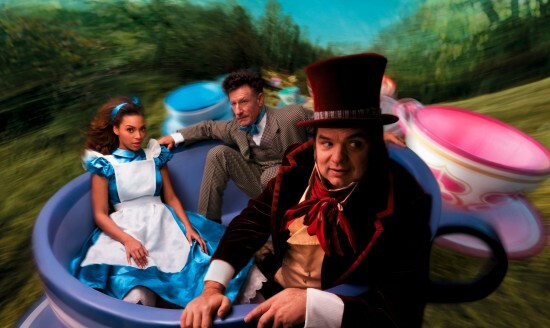 Check out Annie Leibovitz’s Disney Dreams Portraits here!